Review: This film takes place at an old established private school in England. Mick Travis, along with his school chums, trumps authority at every turn, finally emerging as a violent saviour in the vicious games of one-upmanship played by both students and masters. A timeless classic!!!!!!!!!!!! This remains one of cinema’s most unforgettable rebel yells. Such a terrific film. This is Malcolm McDowell’s film debut and was reportedly paid £90 a week for this role. He plays such an unforgettable role in this and his acting is extraordinary. This film was shot at the director Lindsay Anderson’s actual old school in Cheltenham, which was Aldenham School, England. The cafe that is used in this film was called The Packhorse Cafe; this no longer exists. It was situated on the A5, a few miles south of Dunstable near Kensworth. Where the cafe was is now a petrol station. The scene with them at the motorbike shop was filmed at the Broadway Motor Company on Gladstone Road, Merton, London SW19. The garage is now a Wetherspoons pub. Also, St John’s Church which was situated on Albion Street, Cheltenham was later demolished. Just before Lindsay Anderson’s death he had completed a final draft of a proper sequel to the film, but it was never made, which I am glad about as this will always be a standalone feature. As no sequel was made this will always be a classic film. In 2013 Film Critic Barry Norman produced a list of the 50 Greatest British Films in the Radio Times and this was listed. 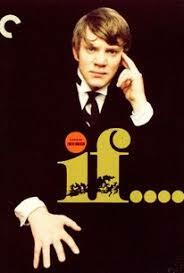 At the Cannes Film Festival in 1969 Lindsay Anderson won the Palme d’Or Award.